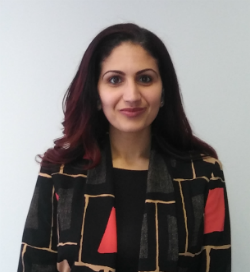 Hiller, PC welcomes back Fatima Afia, who previously worked for the firm as both a Summer Associate in 2015 and a Paralegal from 2010 until 2013, and is now returning to join the Hiller, PC team as an Associate. As an Associate, Fatima contributes significantly to many of the firm’s most successful practice areas including complex commercial litigation, business law, land use and landmarks law matters (often resulting in Article 78 proceedings), and disability insurance law. While pursuing her legal education at Brooklyn Law School, Fatima served as a legal intern and student clinician for a variety of public offices. Fatima interned with the Administration for Children’s Services (ACS), Division of Family Court Legal Services, representing ACS in its protection of the city’s children and youth from abuse and neglect. She was also selected to participate in a competitive clinical program – Brooklyn Law School’s Federal Civil Litigation Clinic at the NYC Law Department – where she defended the City of New York and its employees in connection with federal civil rights lawsuits against members of the Police Department and the Department of Correction. During the course of this year-long clinical program, Fatima gained valuable litigation experience by, among other things, deposing an incarcerated plaintiff in a § 1983 action involving claims against the NYC Department of Corrections for a variety of constitutional violations. While completing this clinical program, Fatima simultaneously interned for the Honorable Ellen Gesmer of the New York Supreme Court. While in her last year of law school, Fatima was selected to intern in another year-long clinical program – the Brooklyn Law Civil Rights Clinic at the Office of the Attorney General (OAG) – where she greatly assisted in the enforcement of local, state, and federal anti-discrimination laws on behalf of the New York State government. As a student clinician for the OAG, Fatima played an important role in protecting minority home buyers against predatory lending practices employed by various banks across New York State and ensuring that minority/small business owners were being treated fairly by general contractors bidding on government contracts.